“Look closer,” says Dr. Pamela Noyes. “Where…?” I ask. I entered the lab in search of a zebrafish aquarium, but now my attention is drawn to a thin plastic plate, about the size of a postcard. “There’s a zebrafish there?” I squint my eyes tighter. “Ninety-six of them!” exclaims Dr. Noyes. Sure enough, nearly a hundred little black specks are swimming in a matrix of tiny circles – each organism no bigger than a ground up peppercorn. I have been given the opportunity to check out a recent innovation: zebrafish and high-throughput testing. How much can this inconspicuous fish really tell us about chemical reactions in our body? Well, paired with state-of-the-art robotics, zebrafish can provide insight into a series of complicated human health responses and abnormal development due to chemical interactions. By using the cutting-edge technology of high-throughput testing (a combination of advanced robotic automation techniques and data processing software), scientists can take advantage of the zebrafish’s small size to study a large number of chemicals all at once. Additionally, these fish have two other vital characteristics: 1) rapid development and 2) many shared genes with humans. 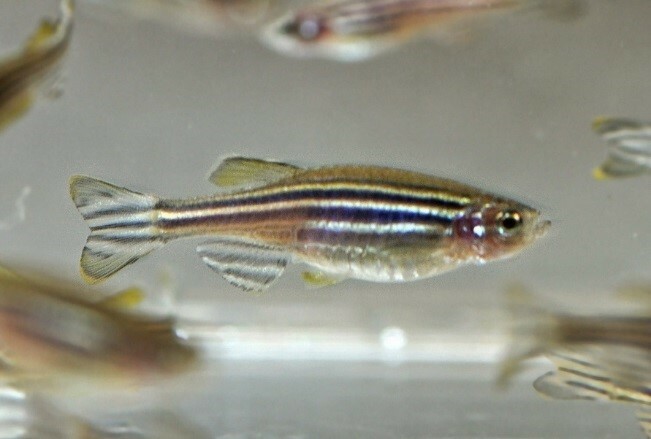 Each zebrafish is exposed to a chemical of interest and studied from the embryonic to larval stage, by which time, most of their organs are fully developed and functioning. While this kind of development would take years for humans, it only takes a matter of days for zebrafish. During this timeframe, researchers can study anything from abnormal physical traits to erratic behavior of individual zebrafish to pinpoint how a chemical may alter normal development. With so many chemicals in the world today and even more under development, scientists need a rapid, economical, and accurate way to screen for chemicals that may be harmful to humans and wildlife. The use of zebrafish in high-throughput testing is increasingly important to chemical research initiatives at EPA. In fact, zebrafish studies by Dr. Noyes (in the laboratory of Dr. Robert Tanguay at Oregon State University) recently received national acclaim for their contribution toward flame retardant research. Dr. Noyes’ study shows that exposure to certain flame retardants is potentially associated with various neurological changes in zebrafish. Flame retardants are chemicals added to manufactured materials— such as plastics, textiles, and surface finishes and coatings— to suppress the spread of fire. These chemicals include organophosphate flame retardants, as well as several polybrominated diphenyl ethers (PBDEs), and the heavily used bisphenol-A analog tetrabromobisphenol-A (TBBPA). Dr. Noyes’ research only begins to identify these complex health outcomes and stimulates further research on human health. Perhaps even more importantly, it provides an opportunity to design safer chemicals. Turns out this little fish is behind a lot of big ideas here at EPA! Find out more information about EPA’s efforts to evaluate chemicals for adverse health effects – http://www.epa.gov/chemical-research. Information on Dr. Noyes award and other conference events can also be found on the 2016 Society of Toxicology Conference website. About the Author: Ben Zukowski is a student contractor at EPA’s Chemical Safety for Sustainability National Research Program. A graduate from the University of Michigan, he has worked with environmental issues across North, Central, and South America.